Lokomotiv's title defense came crashing to a halt tonight as the red and green fielded a heavily weakened lineup and were upended by Amkar who wanted the win slightly more than we did. The bench was emptied as Abaev, Logashov, Barinov, Yanbaev, and Skuletic all got the start among a handful of more regular players. The team gave free tickets for the central sectors to anyone wearing green tonight as part of a special promotion to try and get some fans in the stadium and I think it was mildly successful as an announced crowd of 8,000+ turned out. I used this occasion to change my regular seat in the south sector and see the stadium from a different perspective which was the highlight of the night for me. 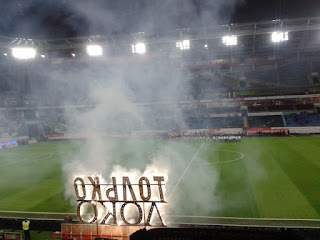 Loko didn't seem too interested in the first half and only manged a couple of chances from a Fernandes strike and a Maicon shot which bounced goalwards off a defender. The ball was given away much too easily in midfield and we failed to use the flanks effectively, our usual strength. 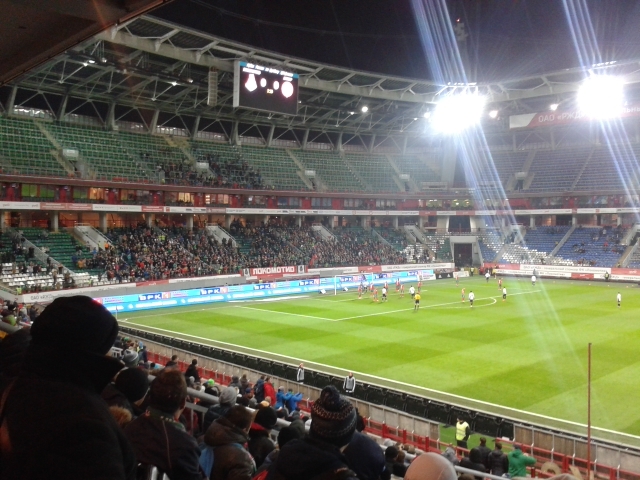 Amkar held the advantage in possession and seemed camped in our end at times, though didn't pose any major threat. Things opened up a bit more in the 2nd half and Grigoryev, who came on at the half for Kasaev, almost opened the scoring with a shot taken after his header deflected back to him off a free kick. In the 57th minute though, the visitors took the advantage when Dzhikiya launched a spectacular free kick past Abaev for a 1-0 lead. This woke up the Railwaymen and Miranchuk and Niasse were brought on to try to save the game. Unfortunately, sloppy passing and a failure to keep meaningful possession along with frustrating time wasting tactics by Amkar drained the clock, but a strong Niasse header off of a corner kick nearly equalized the game in the dying moments. Unfortunately, it was straight at the 'keeper and we were eliminated. Today, Loko showed that the Cup was not a priority this season and the team prefers to make more headway in the league and in Europe. I understand it, but I love cup competetions and it's disapppointing to see the defending champions be eliminated with barely a whimper, especially when it's our best chance for a trophy this year. Also, that makes two losses for us in four days with zero goals scored. Is it something to worry about? We'll see, but let's hope the rest does the primary starters good and they grab some important points in their two huge away matches next week in away at Kuban and in Istanbul.